Brinks Home Security is taking a different approach to the smart lock, tapping Wi-Fi where most of its competitors rely on low-power solutions such as ZigBee, Z-Wave, or Bluetooth. To solve Wi-Fi’s power-consumption issues—the very reason most battery-powered smart-home devices don’t use it—Brinks mounted a solar panel on the lock to keep its battery topped off. Hartung says the company’s goal since development on the Array began in 2014 was a lock that is easy to install and use. Wi-Fi was chosen so the customer could connect the deadbolt directly to their router, and the design of the lock is such that installation requires only a screwdriver. “ZigBee and Z-Wave requires a level of knowledge that we believe introduces complexity for the end user,” he explained of the choice of Wi-Fi. While Hampton Products intends to make the lock compatible with smart home systems such as Apple HomeKit and Nest in the long run, it will be a stand-alone device at launch. Consumers will be able to open the deadbolt using its keypad, a mobile app, or a conventional key. Users will also be able to manage access by issuing e-keys and codes that will allow others temporary access to the home. The app displays lock status and shows when and by whom the door is locked and unlocked. All data is encrypted and secured by two-factor authentication to ensure security, Hartung said. Power management is one of Array’s coolest features. 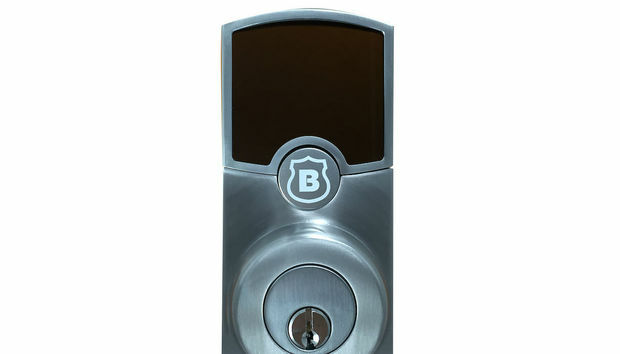 An onboard battery powers the deadbolt, and a small solar panel integrated into the keypad continually charges the battery even in low-light conditions. “The battery lasts multiple years under normal usage conditions. If the battery were to fail, it is replaceable,” Hartung said. The impact on you at home: Relying on Wi-Fi is a smart solution, and if the solar panel indeed works even in low-light conditions, it will solve the Wi-Fi power-consumption problem. Those design choices could make the Array an attractive solution for people who just want a smart deadbolt. Unlike some upgrade solutions that leave the exterior side of the deadbolt in place—Kwikset’s Kevo Convert and the Danalock, for exmaple—installing an Array in place of an existing deadbolt replaces the entire lock. That will make it less attractive to renters. since most landlords will balk at the notion of requiring a new key. Hartung declined to comment as to whether or not Hampton might offer a similar SKU down the road.